Why Should We Go to Church on Sunday?﻿ Or the Sabbath? Why Should We Go to Church on Sunday? Most Christians have a practice of going to church on Sunday. Some people even go twice. Why do we do that? Why do we go to church every Sunday? The quick answer that most people would give is that’s what the Bible says to go. But I don’t see that in the Bible. Yes, it does say that we should not give up meeting together (Hebrews 10:25), but this says nothing about church or Sunday. It just says to pursue spiritual community. It’s always perplexed me why we meet on Sunday and not Saturday. Granted, Jesus rose from the dead on the first day of the week, on Sunday. And his followers happened to be together on that day, but they were hiding out of fear, least they too be captured and crucified (John 20:19). And Paul did tell the people in Corinth to set money aside on the first day of each week for a special collection for the people in Jerusalem (1 Corinthians 16:2). But this was a command to one church for a short-term initiative. When it comes to Sunday, that’s about it. By the way, the word Sunday doesn’t appear in the Bible. So meeting on Sunday seems more of a tradition than anything else. I certainly don’t see this commanded in scripture. The word Sabbath occurs 150 times in the Old Testament, God gives a lot of instructions about the Sabbath. Two themes reoccur. Rest: First, the Sabbath is a day of rest (Deuteronomy 5:14 and about fifteen more places). God tells his people to do no work on the Sabbath. The other six days of the week are for work and the seventh, the Sabbath, our Saturday, is for rest. This is what God did when he created us. Six days of work followed by a day of rest. There’s a nice rhythm to this. Work and then rest. Our rest on the seventh day gives us a break from our work. This prepares us to work more effectively for the next six days. Holy: The second key element of the Sabbath is that it’s holy (Exodus 20:8 and about twenty more places). The Sabbath is set apart. The Bible also says to execute anyone desecrating the Sabbath (Exodus 31:14). That’s some serious stuff. But what does it mean to keep the Sabbath holy? Though we can find some guidelines in the Bible, it’s up to us to determine what this means for us today and how to apply it. Supporting Thoughts: Here are some secondary biblical versus about the Sabbath. Observing and celebrating the Sabbath is a lasting covenant (Exodus 31:16). The Sabbath is a sign between God and his people (Ezekiel 20:12 and Ezekiel 20:20). Every Sabbath required a burnt offering (Numbers 28:10), but Jesus fulfilled this. We should delight in the Sabbath (Isaiah 58:13). Yet to Isaiah, God also says, “I cannot bear your worthless assemblies.” This includes their Sabbaths (Isaiah 1:13). And in Hosea, God says he will stop the Sabbath celebrations (Hosea 2:11). This certainly gives us something to contemplate. Interestingly, just as I’ve found no command in the Bible to meet every Sunday, I’ve yet to find a verse that tells us to meet every Sabbath. Though some of the Old Testament’s celebrations did fall on the Sabbath, which required the people to have special observances on those days, this certainly wasn’t an every-week occurrence. 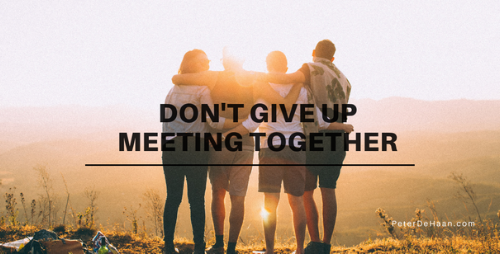 If we’re going to do things according to the Bible, the one essential command is that we must not give up meeting together. This doesn’t necessarily mean church, Sunday, or weekly. It simply means pursuing intentional spiritual community, and though Sunday church may be one way to accomplish this, it’s not necessarily the best way. Next, if we want to factor the Old Testament into our thinking, we should set aside one day for rest and keep it holy. That’s about it. How we do this seems up to us to determine.